Hello to all fellow Corvette fans out there from Pumpkin Fine Cars & Exotics and owner Franck Freon, a 2001 Daytona 24 hour Winner and former Corvette Factory Driver. Franck is pictured here with this Classic Corvette. It's a 2007 Chevy Corvette C6. 8 cylinder 6.0 liter engine 6 speed. This Corvette comes equipped with a removable top, 19 inch Alloy Wheels, and Xenon Headlights. Its unique Atomic Orange exterior makes this car irresistable. Feel free to call or stop by and test drive this pre-owned Chevrolet Corvette today. Franck's warm personality, technical advice and nostaligic race stories are always free of charge at Pumpkin Cars in Egg Harbor Township. Come in to see the Corvette or one of our perfect condition pre-owned BMWs, Mercedes-Benzes or Hondas! We are the specialists in South Jersey in the category of perfect "mint condition" used cars. We hope you're enjoying another gorgeous Summer day in the Greater Philadelphia/South Jersey area. Here at Pumpkin Fine Cars and Exotics we are known for our hard work and dedication in every aspect of the business. Hector, our expert detailor, works hard rain or shine to ensure all Pumpkin Fine Cars gleam when delivered to you, our valued customers. 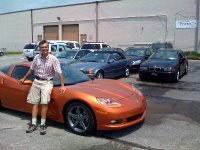 Pumpkin Cars guarantees you drive the best pre-owned cars in South Jersey. Of course, Hector is happy all that June rain is over and it's a little more pleasant to achieve the Pumpkin level of perfection with our cars this month! Pumpkin used cars are more than mechanically sound -- they are in perfect condition inside and out. As good-looking and well maintained as all Pumpkin cars are , they're even better to drive. So stop by for a no obligation test drive today. We welcome everyone here at Pumpkin Cars. No sales pitches, no gimics, no pressure. Come enjoy a free ride at Pumpkin today. We want to wish everyone a safe and happy 4th of July 2009. As always, with the holidays comes lots of traffic and sometimes crazy drivers, so please drive safely as your headed to the beaches in your Mercedes Benz. There will be plenty of kids out and about and we want everyone to enjoy the much needed time off . As we come together with family and friends for this nice long weekend get out and enjoy the fireworks displays that will be going on throughout South Jersey. Pumpkin will be closed tomorrow, Saturday in observance of the holiday but we will re-open Monday at our regular showroom hours of 10:00am-6:30pm. Bonjour from Pumpkin Fine Cars and Exotics, we hope everyone is enjoying the beautiful weather today. We want you to take advantage of this gorgeous day. So, come visit us at the Pumpkin showroom to check out our superbe selection of BMW's, Mercedes, and Honda's. 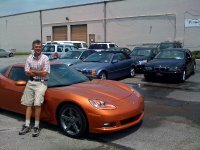 View Pumpkin Fine Cars and Exotics' complete list of mint condition pre-owned vehicles at http://www.pumpkincars.com/. If you're unable to visit us today, perhaps you could visit the Mad Batter Cafe in beautiful Cape May New Jersey. Sitting on the porch of this quaint bed and breakfast/hotel in South Jersey is like being at an outdoor cafe in Italy or France. The food at the Mad Batter was fantastic and Gina especially enjoyed the refreshing "Taste of Paris Martini". 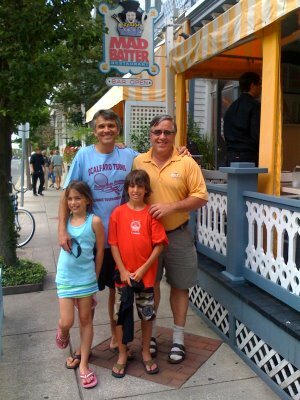 Of course we remind you to walk not drive (even a fine used Mercedes Benz, BMW or Honda from Pumpkin) around Cape May and enjoy other fine stores and attractions like the Flying Fish Boutique after you indulge in a delightful leisurely lunch just like the Europeans do!